Smoking is death to finger tips. 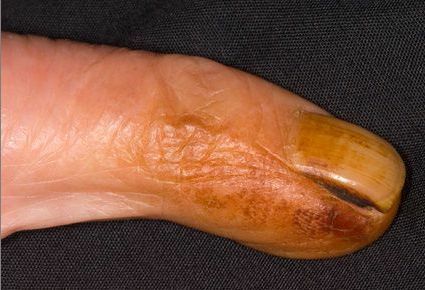 The same reason you can’t lose too much blood of fingertip injury – tiny blood vessels – lead to gangrene and fingertip amputation, if clogged by smoking. Quit smoking before you lose your fingers. I had to stop smoking at once, after second fingertip surgery. The procedure involved moving a pedicle flap, which is fed with blood by tiny vessels. Nicotine and tar kills them at once, and the flap dies. I held on for a month or two, and then started smoking again. Actually, it wasn’t the first attempt to quit the habit. By no means it was! Like Mark Twain, I tried dozens of times. In fact, prior to the injury I was in another leap of giving up. I didn’t buy any cigarettes for other a year, but my friends at work gave me one each time they went out for a smoke. That’s a point for many smokers. Loosing the old company. And an excuse to make a break. Everything was in vain. I couldn’t quit smoking. Actually, I developed regular evening headaches from daily smoking, but still couldn’t stop. The desire was tremendous, but the reality was very different. The thing that finally helped me to quit smoking was an electronic cigarette. Actually, I head of them long before, but the description read “a LED at the tip resembles real cigarette light, and the device provides nicotine liquid”. I thought, what a stupid childish device – sucking nicotine solution from a blinking cigarette-like tube? That’s like those cigarette-shaped chewing gums. And so I forgot all about it. Until one of the colleagues at my new job got one. It turned out, the device actually produces smoke-like vapour. So I decided to get one myself. The vapour of e-cigarette is not exactly like cigarette smoke, it’s more like that of hookah. Anyway, that was the thing I needed to substitute the real cigarettes. Together with strong desire, it helps me to avoid smoking for over one and a half years now. If you would try to switch to electronic cigarettes, don’t hesitate: it’s quite cheap. I would not recommend any particular brand, but would give some advice on what to get instead. First, you need a battery. Choose a manual passthrough battery with 510 connector. Manual means the vapour will be generate while the button is pressed. Believe me, that is more convenient than breathe activated (like in real cigarettes). Passthrough means it has a mini-usb port and can be charged from any USB power source, like a computer or a wall charger. That means you don’t need to invest in an additional charger, and you can get mini-usb charging almost everywhere. The 510 is just a threading metric. 510 is the most popular, so you won’t have trouble with getting other parts. Don’t hunt for high capacity, Chinese manufacturers often fake that. 650-1000 Mah is an optimum choice. Second, you need a clearomizer. Clearomizer is an atomizer, a device, that produces vapour out of liquid with the help of electricity from the battery. They are refillable and disposable, and normally last from 2 to 4 weeks. The taste declines after that. So get a pack of at least fifth edition 1.8ml clearomizers of 2 Ohms. Fifth edition got most of the leaking and other issues fixed, 1.8ml will last you for at a couple of days, and resistance of 2 Ohms provides balanced taste and performance. The threading should match that of the battery, so it’s a 510 connection. The final thing you will need is the e-juice. E-juice is the liquid, containing propylene glycol, vegetable glycerine, food flavourings and nicotine. That is what makes the smoke-like vapour when heated with atomizer coil. If you used to smoke a pack of lights a day, get a 30ml 18mg/ml bottle. Make it 24mg/ml if you smoked full flavour. Mg/ml means each ml of e-liquid contains the given mg of nicotine. An average vaper consumes 1 ml a day, and the bottle will last you for about a month. As for the flavour, get a DON HILL or Maxboro, or just get three 10ml bottles of various flavours. Or six 5ml bottles. Traditional blends satisfy most tastes. Personally, I get the components and mix my own e-liquids, but that’s advanced level. The set should cost you more than 40-50 USD depending on brand and shipping. If it does, the shop is ripping you off, so choose another one. Some doctors say, if you stop smoking before thirty, your body will fully regenerate. It’s never too late to quit, and fifty bucks is nothing compared to the health benefits you get. Don’t expect miracles though: without willpower and great desire to get default, no gadget will help you. Be strong. Before e-cigarettes, the common moment to start smoking all over again was parties: you just need to smoke after a drink or another beer. Now I just take that e-cigarette with me, and that satisfies the craving. I also don’t add nicotine anymore, so it’s just flavour now. The e-juice components are used in cooking, and are considered harmless additives. And real tobacco already has PG, VG and food flavours added during cigarette manufacturing, so smokers get them anyway. My headaches stopped. They return instantly if someone smokes nearby, so I have to go to non-smoking sections of restaurants. I’m happy with my healthy e-cigarette. My clothes and hair don’t smell of tobacco now. My breath is not disgusting anymore. I gained a few pounds because of metabolism change, but I have more willpower to get rid of them. My nose is as sharp as it used to be a decade ago. The only thing I miss, is that click-crack sound of my lovely Zippo.